Homefield advantage is real, really real, and those who ignore its effects on fantasy football do so at their own peril. For instance, last season, my two worst DFS weeks came when I spent the weekend at my grandparents’ house. Okay, maybe that’s a bad example. How about this? Since 2000, quarterbacks average 16.3 fantasy points per game and a passer rating of 85.6 when playing at home. When on the road, they average only 15.3 fantasy points per game with a passer rating of 81.5. While almost all quarterbacks tend to perform better at home than on the road, home field advantage can matter much more for some players than others, and in several cases the difference can be drastic. For instance, did you know that, statistically, Ben Roethlisberger has the most-glaring home/road splits of any quarterback? Oh, you did know this? Because every fantasy analyst never shuts up about it? Oh, okay. Well at least we’re on the same page. But did you know just how crazy his splits are? Since 2014, including the postseason, Roethlisberger’s 13 highest-scoring fantasy games have all come at home. Over this span, his passer rating jumps by 19.3 when playing at home, and he scores 9.4 more fantasy points per game more at home. 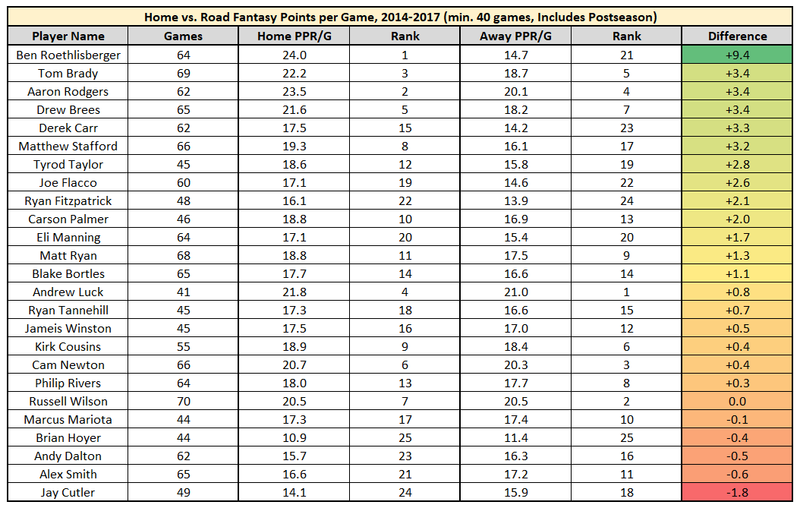 Over this span, Roethlisberger is the most productive fantasy quarterback when playing at home. When on the road, he ranks a lowly 21st (of 25 qualifying quarterbacks) in fantasy points per game, well below names like Blake Bortles and Jay Cutler. As you can see below, Roethlisberger’s 9.4-point differential is the most by a wide margin. I’m typically skeptical of home/away splits. In the NFL, we have a much smaller sample size to work with than the other major sports. In fantasy football, specifically, we can always twist numbers to produce outliers when given any variety of splits, but not all of them are meaningful. For instance, throughout their respective careers, Odell Beckham Jr. averages 4.3 fantasy points per game more in even-numbered weeks and Mike Evans averages 3.7 fantasy points per game more in odd-numbered weeks. Obviously, these splits are meaningless, and are based solely on small sample variance. However, if instead these were home/away splits, fantasy analysts would never be able to shut up about them. In the case of Roethlisberger, on the other hand, we have a much more glaring, persistent, and robust sample. This past year, I went out of my way to vault Roethlisberger up my rankings when he was playing at home. For the most part, it paid dividends. Next season, in DFS, I’ll gladly roster Roethlisberger each week he is under-priced or under-owned when playing at home, regardless of who the opponent might be. In redraft, I’m fine taking Roethlisberger in the late QB1-range, but also won’t be afraid of benching him for another quarterback in a better matchup when he’s playing on the road. After all of this, I had one final question. What is causing these splits? After an additional few hours of research, I was unable to come up with a compelling answer, but my best guess is this: Roethlisberger, absurdly, averages 2.77 passing touchdowns per game at home since 2014, but only 1.09 touchdowns per game on the road. That 1.68 difference in touchdowns per game accounts for 71 percent of Roethlisberger’s fantasy point differential. Looking at Pittsburgh’s red-zone splits over this span, it’s easy to notice that the Steelers lean far more pass-heavy at home than on the road. Since 2014, they passed on 63 percent of their red-zone plays at home (league average is 55 percent), while passing on only 52 percent of their red-zone plays on the road (league average is 54 percent). While this certainly doesn’t tell the full story, it’s the best I could come up with outside of the more obvious factors like rest, travel, crowd noise, and familiarity.